The White House pushed back forcefully on Wednesday against suggestions that a plea deal struck by US President Donald Trump’s former lawyer Michael Cohen implicated Trump in a crime. 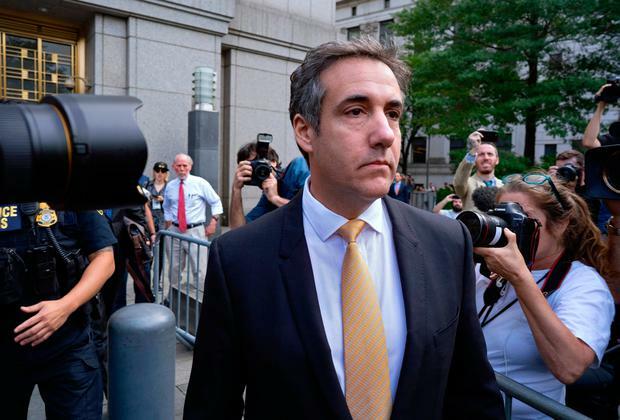 Cohen on Tuesday pleaded guilty to eight criminal charges of tax evasion, bank fraud and campaign finance violations. He told a federal court in Manhattan that Trump directed him to arrange payments ahead of the 2016 presidential election to silence two women who said they had affairs with Trump. Earlier, the president lashed out at Cohen in a Twitter post by saying the campaign finance violations Cohen pleaded guilty to in federal court in New York were not a crime – even though prosecutors and Cohen agreed that they were. Trump made the claim without offering any evidence. At the same time, Trump on Twitter praised former campaign chairman Paul Manafort, who was convicted on Tuesday of multiple counts of fraud, as a “brave man” for not cooperating with federal authorities. Fox News released excerpts of an interview conducted with Trump on Wednesday in which the president said he knew of the payments made by Cohen “later on” but did not elaborate. After first denying that he knew anything about Cohen’s actions, Trump earlier this year acknowledged he reimbursed Cohen for payments he made in late 2016 to Stormy Daniels, an adult-film actress whose real name is Stephanie Clifford. Daniels has alleged she had a relationship with Trump. The president has insisted he paid Cohen out of personal funds and that the payments were not intended to benefit his campaign but to resolve a personal matter. Trump critics have argued the case being made by the president that the payments to Daniels and McDougal were personal do not hold up given the timing – only weeks before the election. New York investigators on Wednesday issued a subpoena to Cohen in connection with the state’s criminal investigation of the Trump Foundation, a state official said. Trump has granted presidential pardons to conservative commentator Dinesh D’Souza and former Arizona sheriff Joe Arpaio but Cohen attorney Lanny Davis said his client would not accept one. “Mr. Cohen is not interested in being dirtied by a pardon from such a man,” Davis told NPR. Cohen’s plea came as Manafort was found guilty on eight charges in a separate financial fraud trial in Alexandria, Virginia, stemming from a federal investigation into Russian meddling in the 2016 U.S. election and possible coordination with the Trump campaign. The Cohen and Manafort cases ratchet up political pressure on Trump and fellow Republicans ahead of November elections in which Democrats are seeking to take control of Congress. The Mueller investigation, which has clouded Trump’s presidency for more than a year, and Tuesday’s developments also increase pressure on him personally. While Cohen did not name Trump in court on Tuesday, referring to him as “the candidate,” Davis on Wednesday accused the president of being directly involved. Democratic Senate leader Chuck Schumer, speaking on the Senate floor on Wednesday, insisted the confirmation hearing scheduled for Kavanaugh in early September be pushed back. Other Senate Democrats said they were canceling their meetings with Kavanaugh and considered his nomination tainted. Schumer said he was concerned that Kavanaugh, a federal appeals judge, told him on Tuesday that presidents should not be subject to criminal or civil investigations – or even be required to comply with related subpoenas – while in office and that impeachment by Congress is the only legal recourse. On the Senate floor, Schumer argued that Trump should not be permitted to select a Supreme Court justice who could ultimately end up hearing a case involving the president. “A president identified as a co-conspirator of a federal crime, an accusation not made by a political enemy but by the closest of his own confidants, is on the verge of making a lifetime appointment to the Supreme Court, a court that may someday soon determine the extent of the president’s legal jeopardy,” Schumer said. Russia has denied U.S. intelligence community findings that it interfered with the 2016 election with the aim of boosting Trump and hampering Democratic challenger Hillary Clinton. Trump has denied any collusion by his campaign with Moscow and repeatedly called Mueller’s investigation a witch hunt.